If there's something you need to do in Zhuhai, it has got to be Go-Karting! It's been told by many that you cannot leave this place without trying it out. Just ask Joe, our ODM staff based in Zhuhai and you will know how exciting it is! Underground Car Park Race Track! You will be amazed by how they work. There is barely any friction on the ground as you can see from the picture above. The race track is also located in an underground car park! However, safety measures just as helmets are still taken. I think I drifted 4 times within 10 mins and bang into the tyres twice!!! Do try it out if you happen to be in Zhuhai! Exciting isn't it? ODM offers internship programs and we have an office in Zhuhai, drop us an email if you're interested! There were lots of sleeping bags hen parties and caravans for drivers and team managers to rest a bit.. but eventually, no one did! After spending nearly 4.5 months back in China, it is time to retrace my steps and go back home. During my internship in Zhuhai I have learned, laughed and experienced so much more than I was expecting when I hopped on that plane back in August. Zhuhai is a lovely little city and much more modern than I thought at first! It was great to be in China again and to notice my Chinese improving with each day. I ate all the mooncakes during Midautumn Festival, had the great opportunity to visit Guangzhou twice, celebrated my birthday at an awesome island festival and met so many wonderful people. Guangzhou is also an amazing city, only an hour away by train. Some of my fondest memories of China were made here: from doing an awesome boat tour and having drinks on the 99th floor with a view of the Canton Tower, to strolling around and drinking rose tea in an Antique street and visiting the Guangdong Museum. If you are reading this blog you might be interested in an internship in China! I am a business student of 22 years old. I decided to take a gap year from May 2017 to August 2018. I have always been interested in this country. I don't really know why but I wanted something which would take me out of my comfort zone. I started applying for internships in February. I came up with an answer in March at The ODM group. It was so exciting! Everything was going so quickly, I wasn't ready for this! It is after getting my visa for China that I realized that I was coming here for 6 months ALONE! and Zhuhai is an amazing city where it's good to live. I also met wonderful people here - it is now a family! My internship went very well, it was interesting to work in a multicultural environment. I enjoyed factory visits and some good and interesting projects I have worked on. 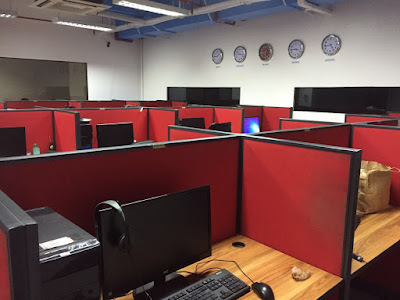 ODMasia has expanded its operations in early 2016 to the Philippines where we currently employing graphic & industrial designers and cold callers. We are constantly looking to add people to our office and work together with our Filipino staff. Cebu is an Island located in the middle of the Philippines and is a really cultural but beautiful place with beaches, you expect from the Philippines and Indonesia. The water is blue and the world under the water is as wild as above. Sharks, turtles and corals. A paradise for diver and people who love to go into the nature after work. The life in Cebu is not as touristy, as you might expect from this area of the world, but this also makes the place really interesting and you can really fall into the Filipino culture. The good thing about the Filipino culture is that nearly everyone is able to speak English, which will make your life much easier than in China for example.